Creating a bit of a pattern by stacking them horiztonally and vertically ensures it's not just a stack of magazines! Pretty things on top seal the deal. 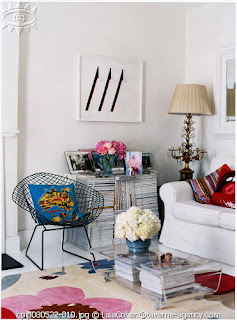 If I didn't have children, I'd so do this: create magazine storage using magazines - stylishly. This homeowner has neatly stacked a rather large amount of mags to form a console table. A piece of glass cut to size rests on top, creating a nice little station for pretty things. Perfect if you can't bear to part with your faves, but don't flip through them on a daily basis as unstacking and restacking regularly couldn't be too much fun. But it looks like she's got that covered: another two easily-accessible piles are on display under the clear coffee table. 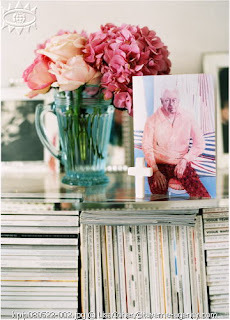 I find it a great idea and love that it's an instance in which magazines physically help create a stylish room, not just tell us how with words and pictures. So, how do you store your mags? I'll be moving office space at home soon and would love to hear some more ideas. Such a creative way to place magazines that you rarely ever open up. P.S. I store my mags on shelving and in some of my bathrooms.. The way I store them depends on the magazine...and how pretty the spine is! DOnna Hay is stored on our kitchen cart for easy access. Home Beautiful and Real Living are on teh wall to wall shelving we have on the landing of our stairs. These three all have predominantly white spines with a pot of colour, so they go with my decorating style. Other mags that I buy on impulse are stored in white + brown mazazine racks on the bookshelf, so they still look uniform. Current issues are randomly located throughout the house - next to the bed, on the ottoman etc! this is such a great idea! i love it - must save this picture for inspiration.